Introduction. With the advances in microsurgical and monitoring techniques, spinal ependymomas are gross totally resected more frequently. The use of adjuvant radiotherapy has become questionable with gross total resection and its role for residual neoplasm need to be redefined. A retrospective analysis of a series of patients was carried out to investigate our clinical outcome and selected use of postoperative radiotherapy. Pre-operative MRI diagnosed the intraspinal tumor, and pathology reports demonstrated that each patient had a histologically confirmed ependymoma. At the time of diagnosis, the most common symptoms presented were pain (in 16 patients=84.2%). The pattern of progression of clinical symptoms was directly related to the location of the tumor. Each patient had an MRI immediately after surgery, approximately 6 months post-operatively, and then annually. 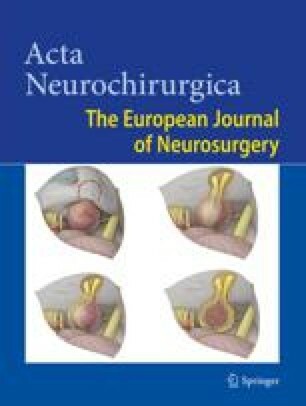 Results All 19 patients underwent intradural microsurgical exploration with an attempted gross total resection (achieved in 16 patients=79%) of the ependymoma through a posterior approach. Direct neural tissue stimulation halted further resection in 2 patients with questionable tumor margins. Radiation therapy was employed as a surgical adjunct in 3 patients (15.8%) because of possible residual tumor. All patients were followed up postoperatively for an average of 50.6 months (range 6 months to 6 years). All patients are surviving to date. Surgical resection of these tumors led to significant alleviation of pre-operative symptoms. There has been no radiographic evidence of tumor recurrence or growth in any patient to date. Conclusion. Surgical resection of spinal ependymoma leads to significant improvement of pre-operative symptom. Surgical removal alone, with an attempt to grossly resect the tumor, should be the treatment of choice, with careful clinical and radiographic follow-up. Radiation therapy should only be considered as a surgical adjunct where gross total resection is not achieved.